When my dad and step-mom visited in November, I had mentioned that I would like a new stitching light. I never thought that they would get me one, but they did! I felt bad since I had gotten a magnifying light after they visited for myself as an early Christmas present. I love the one they got me though and I don't think I'll return it because it not the same as the one I have. It's an overhead light and has wheels, which would make it very easy to take from room to room. Well, I'm going to get back to stitching! Write soon! That's looking so cute! I'm sure you'll have it finished in no time since you're so fast. Jane is also doing a SB and I just started one too. Nicole, you enjoy your "me" time, you deserve it! It's always nice to have a littel alone time. 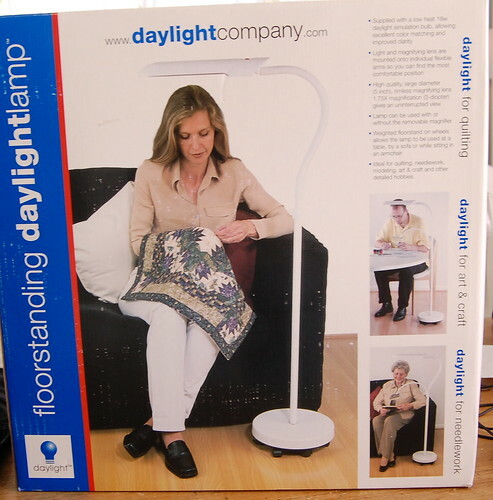 Great new lamp Nicole - I have a similar one but it's an Ottlite but it does not have a magnifier attachment. Enjoy your time while you have no responsabilities; I know the feeling, I have 2 boys of 8 and 5 years old and I also have to jump every 2 seconds. It looks like a nice project you have started. Your progress looks great so far! As you know this is one of my favorites :) Your blog looks great too! Love the header. What a nice gift! Hope you had a nice holiday. Happy New Year! Queen Sheep already looks very great. Looking forward to seeing the finihsed piece. And enjoy your no-responsibility-time! Great start on the project. And the lamp looks great also. 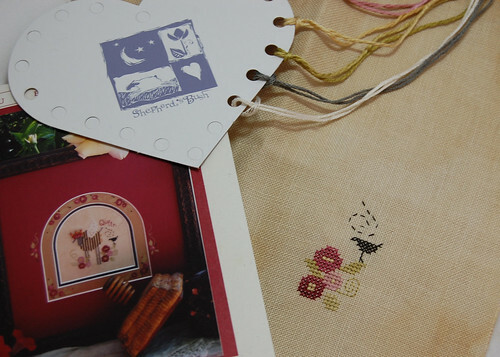 How do you get such good clear pics of your needlework? I am always impressed by your posts. Good to hear you are having some peace after all of the hussle and bustle of Christmas with the boys. Wonderul stitching WIPs you have on the go. Ooooh have fun stitching! Can't wait to see Queen finished! Congrats on your Land of the Free finish Nicole - it's beautiful. Hope you continue to enjoy your break. I have a big Daylite magnifying light - I absolutely love it and couldn't live without it.